Pro-Ject Xtension/Ortofon RS-309D review | What Hi-Fi? When it comes to budget turntables there is no doubt that Pro-ject is king. The company's Debut and Genie models have dominated the sub-£250 sector for more years than we care to remember, picking up plenty of five-star reviews and Awards along the way. However, leading the budget arena also means Pro-ject has a relatively downmarket image. The company has never gained the kind of reverence the likes of Clearaudio, Linn and Michell enjoy, despite making a whole range of higher-priced record players. The Xtension is Pro-ject's attempt to show the world that it's a great turntable manufacturer at all price levels, not just budget. This is a huge deck finished in a high quality wood veneer. Our olive-covered sample is particularly fetching, although it is also available in cherry, apple and black gloss. You can buy the turntable on its own for three grand, but our review deck came with a £1500 Ortofon RS-309D tonearm, which adds £1000 to the price if bought as part of the Xtension package. 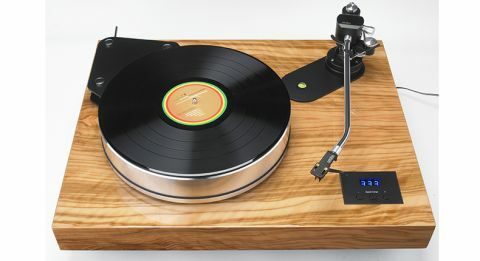 Turntable/arm combos aren't much use without a decent cartridge, and our sample was supplied with an Ortofon Jubilee: a well proven and talented moving coil design that will set you back £1500. By high-end turntable standards the Xtension package is easy to set up. The beautifully finished MDF plinth is solid, leaving isolation duties to a quartet of magnetically sprung feet. These do a good job, but the deck – like any turntable – will still perform best on a dedicated support placed as far away from the speakers as possible. Mains power is delivered by a plug-mounted adaptor and passed through a high quality internal speed controller: the Xtension has a digital display to show exact speed, and can be adjusted in steps of 0.1rpm to get it exactly right. Unusually, the deck has provision to play 78rpm disc, too, though this entails moving the belt manually from one pulley to a larger one. Thankfully, switching from 33 to 45rpm is a more simple affair, done at just the press of a button. The hefty aluminium platter weighs in at almost 6kg and is topped by a layer of vinyl that acts as the mat for the record. The whole assembly sits on a magnetically supported inverted bearing, tipped by a ceramic ball. It sounds flash, and it is. Ortofon's RS-309D arm is a fully adjustable 12in affair with a detachable headshell to make cartridge swapping easy. The longer than average length (most arms are 9in) means tracking error is reduced, which should lead to cleaner results, although this does come at the expense of rigidity and extra moving mass. All thoughts of trade-offs disappear, however, when the stylus drops into the record groove. This Pro-ject has a fluid, easy going sound that can't help but concentrate the listener's attention on the recording. It's a turntable that puts listenability ahead of outright analysis, and as a result don't be surprised if you end up playing records late into the night. We did. Nothing intrudes into the musical experience of the Xtension; it just gets on with the job without adding too much of itself into proceedings. Sure, it isn't wholly transparent: very low-level detail is slightly rounded and dynamic extremes reined in, but neither of these confuses the musical message. You get the full dose of sweetness from Bob Marley's Stir It Up, along with articulate bass and decent timing, and when you switch to Holst's Jupiter, scale and power are in plentiful supply. Nevertheless, there is no shortage of talented rivals for this deck. The best at this price can offer more insight and deliver that extra detail with greater force and stability. That said, the Xtension's job was to prove that Pro-ject was capable of making competitive high-end products. Spend any significant length of time with this turntable and you'll realise that's exactly what it does.